This Fan Friday we have Josh Jones from Las Vegas, NV. Josh is a RawHyde Adventures coach, and avid adventurist. Around 2005 Josh heard the call of the motorcycle and decided it was time, he started with a street bike because his friends were street riders. He spent a lot of time riding street bikes and even joined a MC in Maryland. After watching the movie Long Way Down, his interest was piqued in ADV and dirt riding. 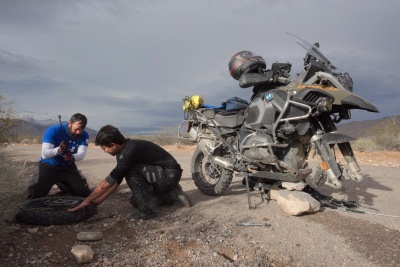 He was so inspired he went out and bought a BMW GS and signed up for a RawHyde Adventures training camp. Before the training even began and with less than 200 miles on his new bike, Josh went out to do some dirt riding on his own. He ended up totally underestimating the challenges of some switchbacks and had his first crash. He then spent the next 30 minutes or so figuring out how to get his bike out of the precarious situation he found himself in. He then had to sheepishly go home with his tail between his legs and refrained from any off-road riding until he got some proper training. After Josh’s RawHyde training he was hooked and was now all about the dirt! To get to the level he is at now he spent lots of time conditioning, building muscle memory and pushing himself. Josh says he learned a lot from simply talking to other riders and immersing himself in the culture. I asked Josh to tell me about a time he had to really overcome a struggle while riding. After going on a ride that was supposed to be easy, Josh says he ran into deep sand and tacoed is wheel pretty badly. Josh and his buddy had to spend considerable time banging the wheel back to straight as best they could. Then they filled the gaps between the wheel and tire with whatever tire plugs and material they could find. On the ride back the repair would last for a while then blow apart and have to be re-patched – eventually Josh made to the street was able to do a real repair job. Josh first learned about AltRider when he started coaching at RawHyde. The bikes at RawHyde have AltRider protection because they dropped regularly with new riders learning. It was easy to see how weak the BMW crash bars are Josh says. He was so impressed with AltRider’s designs he worked to bring AltRider to his BMW dealer in Las Vegas where he works. 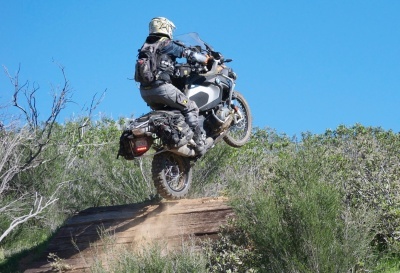 Josh currently rides a BMW GS Adventure and a Honda 450R. 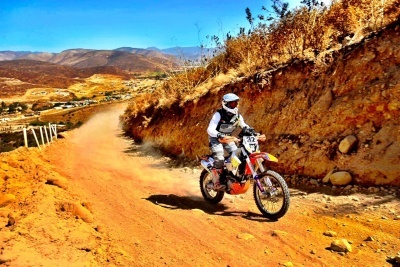 He hopes to make it trip to Alaska next year and eventually race the famous Dakar race. His Instagram handle is @joshuaskjones.